The new AIDA generation will be taking to the seas in December 2018 in the shape of AIDAnova. The world’s first LNG-powered cruise ship, AIDAnova combines the best of her beautiful sisters, while also offering many additional new highlights. Swimming fun, adventure, relaxation, enjoyment, nightlife, shopping wellness and fitness. On board of the AIDAnova the unique HYPOXI-Method takes care of a targeted body shaping. The exclusive HYPOXI-Studio will be adapted in the spacious Body & Soul Organic Spa. Certified HYPOXI-Coaches are available to the guests for individual support. – AIDAnova is full of diversity. The Four Elements exudes a real jungle feel. Surrounded by lush vegetation, guests can climb through the treetops or daydream in cozy, cushioned loungers. For the first time, there will even be three water slides on board. Adventure and culinary arts merge in the new Time Machine restaurant, where guests will enter a world full of wonders, craziness and surprises. During a fantastic time-travel dinner the boundaries between history and the future, reality and fantasy, and entertainment and culinary delights will blur in a magical way. Everything revolves and moves – waiters become magicians, conjuring up a delicious three-course meal. The Body & Soul Organic Spa aboard AIDAnova has an area of 3,500 square meters and offers more than 80 of the world’s most beautiful treatments. For the first time, there are two private outdoor sun islands so that couples can enjoy a truly special wellness experience. Another completely new feature on board is the outdoor sport area with endurance training equipment and training space for morning yoga, Pilates and much more. The summer never ends at the Beach Club. This light-flooded paradise full of Caribbean warmth is protected by a membrane dome that lets the sun and vacation tan in, but keeps the wind and rain out. The highlights on board also include 20 different types of stateroom. The new 73- square-meter Penthouse Suite extends over two light-filled decks. Its guests will be able to enjoy spectacular views through the panorama windows and on the 20-square-meter sun deck. For families, Veranda Staterooms Deluxe will be available for the first time on Decks 15, 16 and 17 with loads of space, and right beside the Four Elements and the Kids Club. The suites with separate bedroom and a walk-in closet are big enough for up to five guests. The Junior Suites with a light-flooded conservatory are another new feature. The new and comfortable single staterooms are available as Interior Staterooms or even have a balcony. AIDAnova offers hitherto unseen culinary diversity with a total of 17 restaurants. Popular classics are enhanced by new trends from all over the world. 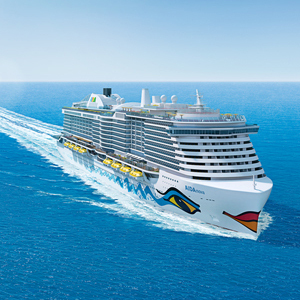 AIDA Cruises’ world-class entertainment is being enriched with new formats that involve the guest even more than before. Surprising and unusual entertainment options produced exclusively by and for AIDA are sure to provide plenty of diversion. Those people who get all nostalgic when they hear Neil Young, or turn up the sound in the car when the Rolling Stones or the Kings of Leon are on, will love the new Rock Box Bar. Fans will enjoy the very finest live music in a cozy pub setting. Those who dare can become stars themselves at karaoke, or demonstrate their musical knowledge at the rock quiz. AIDAnova takes travelers to fascinating destinations around the world – and she also makes a contribution towards preserving the beauty of the oceans and our planet. AIDAnova is the world’s first ship that can be powered entirely with environmentally friendly liquefied natural gas (LNG). By using LNG, emissions of fine dust and sulfur oxides are almost completely prevented and emissions of nitrogen oxides and CO2 are permanently reduced.